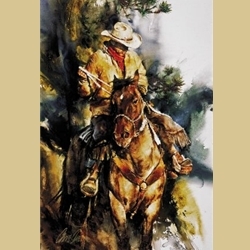 A Cowboy's Morning by Montana artist Chris Owen garnered the very prestigious international Benny Award for the finest giclee printed in 2006. The rich, saturated color plays beautifully against the negative space on the right of the piece, and the eye travels perfectly around the strong composition. The early light plays happily on the rider and his horse creating a sense of warmth and movement.